The former summer residence of the Russian tsars is one of the most evocative sites in Moscow. If you're tired of busy Moscow city life you don't need to go far. Come to Kolomenskoye (15 minute by metro from the center) and enjoy the peaceful beauty of its gardens, a majestic view of the steep banks of the Moscow River, and a unique collection of old Russian architecture. Kolomenskoye is an ancient place. People lived here in the Stone Age and there are archaeological discoveries dating back to between five and three-thousand years B.C. The village of Kolomenskoye was founded in in the 13th century by refugees from Kolomna, a town destroyed by Mongols. In the 15th-17th centuries the village became first a Grand Prince's and then the Tsar's estate. During the reign of Tsar Mikhail Romanov, Kolomenskoye became the favorite summer residence of the Tsar's family. Later Tsar Alexey Mikhailovich turned the Tsar's Courtyard in Kolomenskoye into an original "Kremlin outside Moscow". 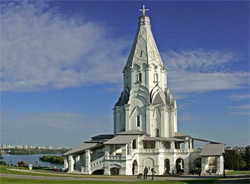 Many old churches are scattered around Kolomenskoye. The most amazing is the Church of the Ascension (also a UNESCO World Heritage Site). It was built in 1529-1532 by the order of Tsar Vasily III to commemorate the birth of his son, Ivan the Terrible. It's probably one of the most beautiful churches in the whole of Moscow. The French composer Hector Berlioz wrote about it: "Here before my gaze stood the beauty of perfection and I gasped in awe. Here in the mysterious silence, amid the harmonious beauty of the finished form, I beheld architecture of a new kind. I beheld man soaring on high. And I stood amazed." While you’re in Kolomenskoye don't miss the House of Peter I. It is the only Moscow memorial museum devoted to the famous Russian Tsar. It was built for Peter the Great in 1702 in the north of Russia when the Tsar spent several months there, controlling the construction of the Novodvinskaya fortress. 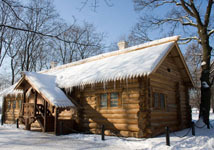 Kolomenskoye is picturesque all year round. If you want to learn more about the history of Moscow, come here with your Moscow tour guide.